combine 1/2c lime juice with 2 tablespoons sugar, heat to dissolve completely, then chill. Add the lime syrup at the beginning of spinning the ice cream. Cook 12 oz raspberries (I used a bag of frozen organic berries) with 2/3 cup sugar, mixing to dissolve the sugar, and continue cooking until much of the liquid has evaporated. I should have cooked this down more — it wants to be a very jammy consistency for the right texture in the finished product. 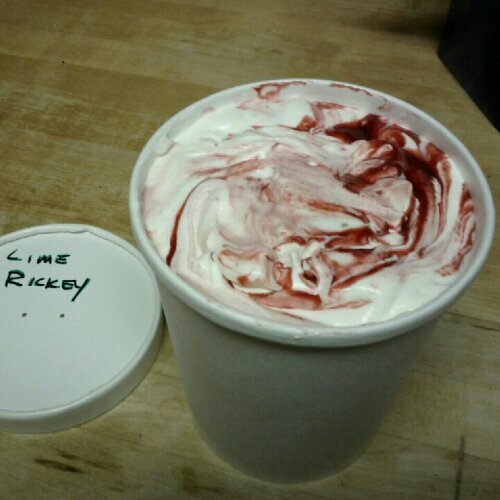 When packing the finished ice cream, swirl the raspberry goo in as you go. The kids complained because it wasn’t green. Sorry, kids.